I don't remember where I found this recipe so long ago (I'm thinking my mother sent it to me...), but it is a treat on a lazy weekend morning! Pictured here using barley flour and goat yogurt, with some extra peaches, blueberries and bananas on top. In a medium bowl, mix together all the dry ingredients. In a smaller bowl, lightly beat the egg, then mix in remaining wet ingredients. Make a well in the center of the dry ingredients, pour in the liquid mixture and stir well to mix. The batter will be somewhat thick. Heat a large frying pan and add a bit of oil. When hot (on medium to medium-high heat), measure 1/4 cup portions of batter on the pan (I could fit 3 at a time). Place peach slices on the batter, cook for 2 minutes, then flip and cook 2 minutes more. Make as many as needed, storing unused batter refrigerated in a sealed container. Serve hot with butter or ghee, maple syrup or honey, and if you like, an extra dollop of yogurt, some more fruit, and a sprig of mint if you'd like to get really fancy. Makes around 8 or 9 pancakes (enough for 2-3 people). Use soy, rice or almond milk and soy yogurt. Omit egg altogether or replace with a flax mixture (1 Tbsp ground flax mixed with 1/4 cup warm water) or half a banana, mashed. I have made it at my home. It is an outstanding recipe. used mangos instead of peaches. yum! used mango instead of peaches and it turned out great! love all of your recipes. 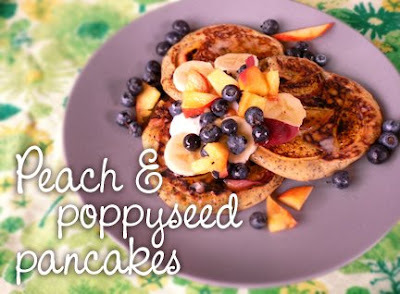 Just finished a liver and Candida cleanse.....and found your poppy seed pancakes to ease on in with fruit again. As being primary kapha ...i did not add the sugar anf switched up the flour but used a smidge of honey on top. Absolutely fabulous Fran!! Thank you.